Rob Kardashian publicly declared his “love” for Blac Chyna on Thursday. 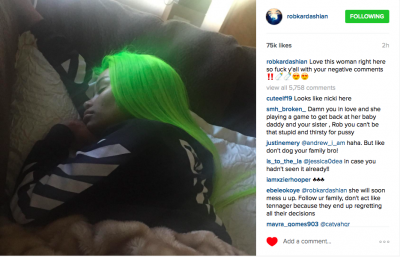 Alongside a photo on Instagram of his neon green-haired girlfriend sleeping, Kardashian wrote, “Love this woman right here so [expletive] y’all with your negative comments.”. Gossip Cop, of course, had no doubt that Kardashian loves Chyna. You have to be in love to drive 19 hours and 1,400 miles from Los Angeles to Austin, Texas, like Kardashian did, to pick up your woman after she’s been arrested for public intoxication, and then do the same long ride back with her. In any event, Kardashian is happy to tell the world about his “love” for Chyna, and he doesn’t care what his detractors and online commenters say. The two, who have only been dating for couple of months, have quickly become serious. 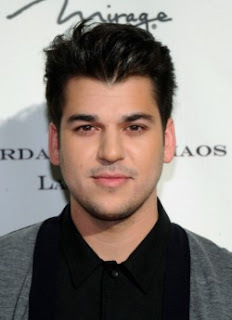 As Gossip Cop reported a little more than a week ago, Kardashian got a new house of his own in the same gated Calabasas, California community that’s home to several of his relatives, including Khloe and Kourtney and Kylie Jenner. We’re told Kardashian is going to have Chyna and her 3-year-old son move into his four-bedroom house when it’s fully furnished. Regardless of what haters feel about the two together, Kardashian has lost weight and begun to look better since dating Chyna.